If you are looking to bring home some of Baba’s cooking, look no further! 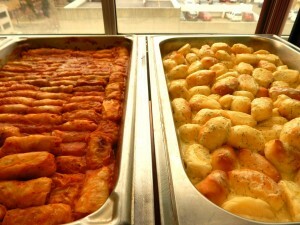 We have handmade, homemade perogies, cabbage rolls (holuptsi), pyrizhky and nalysnyky for sale, all reasonably priced! All frozen, they are easy to thaw and cook for a quick and delicious meal. Please contact us to place your order one week prior to your scheduled pick-up. Note: For cooked orders, there`s an additional cost of $2.00 per 2 dozen. Serving utensils, cutlery, plates (real & disposables) are not included but can be rented/purchased.